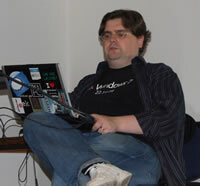 Tonight saw the welcome return of Nick Hodge the Microsoft Professional Geek. 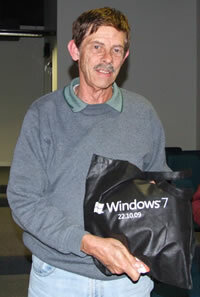 Nick last visited to show us Vista and tonight Nick introduced Windows 7. 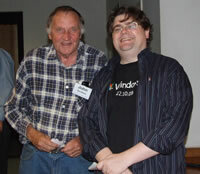 In his usual casual manner Nick spoke of the innovations that look like making Windows 7 a friendly and easy to use system. Starting with the easy-to-use magnifier, “great for those of us who have husbands that insist on having high screen resolutions resulting in tiny fonts”, or so my wife says. 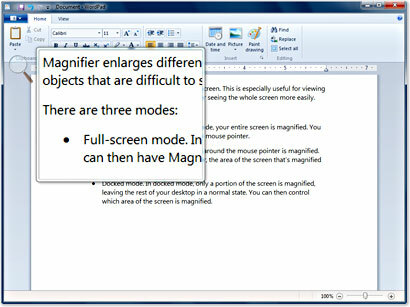 You can access the magnifier using the Windows and P key. 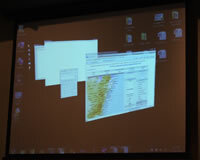 The next thing Nick demonstrated was the way you can scroll through the open windows of Windows 7. 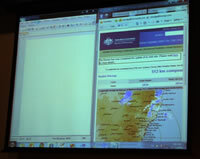 These windows are “live”; we could see the progress of the storm in Newcastle as Nick scrolled past the Bureau of Meteorology web site. 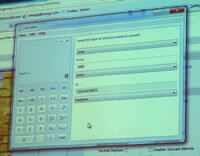 Even the humble calculator got a makeover with the functions being increased to include programmer and statistic modes. The really useful addition for the everyday user is unit conversions. You can now find out what the real measurements are in grams for that 5 ounces of butter used in the American recipe you found on the net. Some of the real innovations of Windows 7 come in the way we can access our files and documents we use every day. Jump List is one of these innovations. It works in a similar manner to the recent document list, but now, using the taskbar, Windows 7 will show you your most frequently used documents for the program you have chosen. It will even add often used commands such as compose new e-mail or play if you are on Windows Media Player. Snap is one clever innovation for your open windows. Gone are the days of resizing and dragging windows to a point on the screen. Using snap you drag the window to the side of the screen and it snaps into place. Drag the other to the opposite side and it snaps into place, displaying two full length windows half the width of your screen. Networking was always a bit of a chore. Under Windows 7 the use of Home group has made networking a much simpler task. 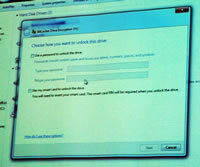 Go to Control Panel, Home Group and click on Create Home Group. You can only create a Home Group on a Windows 7 computer but your other computers, which use older versions of Windows can be joined up. Windows 7 Ultimate edition includes Bitlocker a great way to encrypt your data especially your thumb drives. Microsoft has also created their own antivirus suite and it’s a free down load. It’s called Microsoft Security Essentials and you don’t need to use Windows 7. Not everything is included in Windows 7. Outlook Express for example, is no longer part of the operating system. This is In part due to the law suits in Europe. Microsoft have unbundled some of the programs not directly connected with the operating system. Thus such goodies as Outlook Express have disappeared. 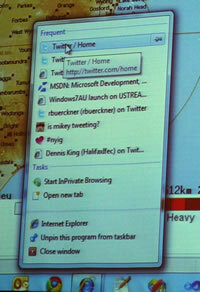 You can now find these programs at Microsoft Live. Outlook Express has undergone a complete overhaul and is now called Mail Live. Here is the full list of programs at Microsoft Live. The good news is that you don’t need Window 7 to run the “Live” programs, they are all free to download and the programs run on any windows platform. Of particular note is SkyDrive, it is 25 GB of free online storage! Is Windows 7 right for your computer? Microsoft Windows 7 Upgrade advisor will tell you. Download it and the advisor will give you a detailed report on both hardware and software compatibilities. My biggest problem is my old scanner. The majority of hands up in the audience indicated that most of us run XP, here’s what the Microsoft web site has to say about upgrading from earlier versions of Windows. 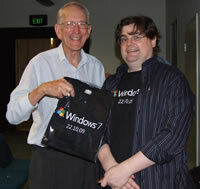 We thank Microsoft for the generosity and the support they have shown the Sydney PC User Group over the years. 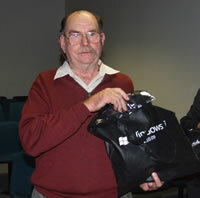 On the release of each new version of Windows, Microsoft have come and demonstrated it for us and generously donated copies for our Raffle. Tonight’s prizes from Microsoft included 5 shopping bags of goodies including T-shirts and caps and two Windows 7 Ultimate Editions. with the other copy of Windows 7 Ultimate. 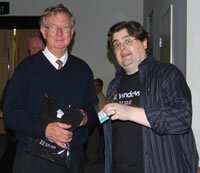 Sydney PC User Group Inc. © 2008 Last updated: Wed. 2 Dec. 2009.